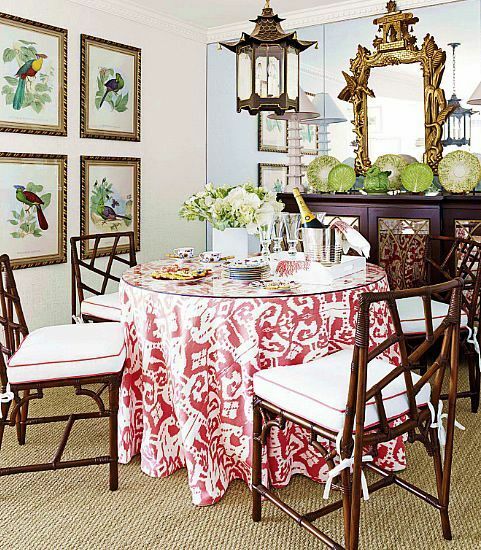 I can totally get behind this airy Chinoiserie dining room. The lantern, the mirror, the chairs and their piped cushions, the Quadrille-skirted table, the dark furniture contrasted with white walls. I am even enjoying the mirrored wall. If I had a beach condo, this would be great inspiration for a smaller dining space. Daniella I completely agree, I love everything about this little dining room! what a beautiful table. love that print table cloth - sets such an elegant stage!